Oil and gas operations, including hydraulic fracturing or fracking, are strictly regulated in Canada. Oil and gas exploration, development and production activities are governed by legislation, regulations and/or guidelines. As fracking has evolved, so too have the regulations that protect Canadian ecosystems and communities. Enhancements to existing regulations will continue to ensure the responsible development of Canada’s oil and gas resources. Who Regulates Canada’s Oil and Natural Gas Sector? Depending on the nature of the activity and where it occurs, federal, provincial/territorial and local governments are all part of the robust regulatory framework. There are also many other provincial and territorial regulating bodies with legislation applying to the oil and gas industry, such as those dealing with environment, labour, safety and transportation. FracFocus is a chemical disclosure registry that provides objective information on fracking in Canada. Its main focus is to provide transparency on the ingredients that make up frac fluids. British Columbia, Alberta, Northwest Territories, Nova Scotia and the National Energy Board are all members of FracFocus.ca. 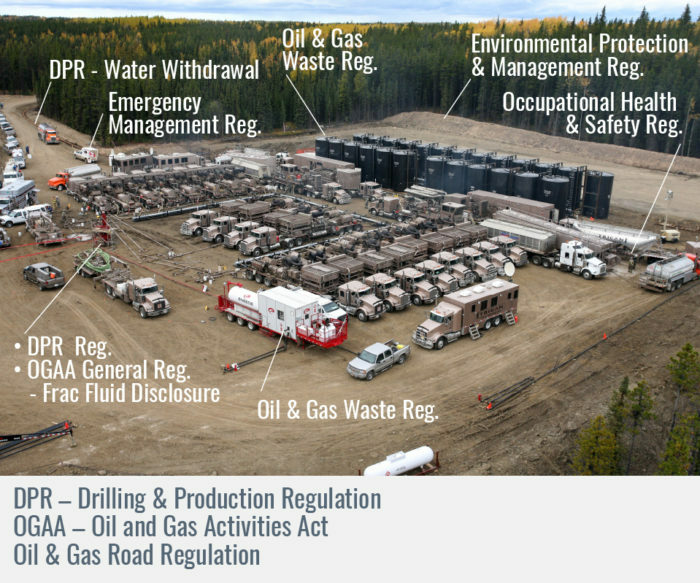 Compliance and enforcement across Canadian oil and gas jurisdictions help ensure the rules are followed at every stage of development, including fracking. Compliance and enforcement programs are designed to safeguard public safety and environmental integrity, and they are built on a foundation of education, prevention, and enforcement. In addition, regulators work hard to communicate with oil and gas operators and service companies on lessons learned, advances in science and technology and making sure the rules and regulations are understood and followed. Industry regulates its operations over and above government regulation. Canada’s oil and gas industry has developed guidelines, operating best practices, and Industry Recommended Practices (IRPs). These are prepared by experienced industry and government personnel and are used in conjunction with all applicable government regulations. Fracking is so new that regulations are just starting to be developed. Fracking technology has been used in Canada for over 60 years. Federal, provincial/territorial and local governments all have regulations to govern fracking. 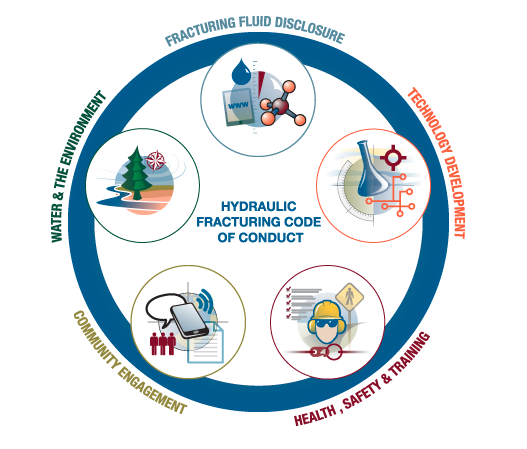 Industry does its part to ensure fracking is done safely by developing recommended practices and operating principles for companies to follow.